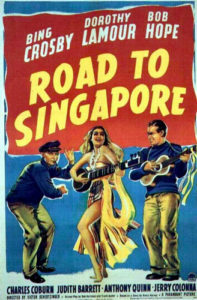 “Road to Singapore” (1940) is the first in a series of movies starring Bing Crosby, Bob Hope, and Dorothy Lamour. The movie was followed by six sequels and ended in 1962 with “The Road to Hong Kong.” The films features Hope and Crosby as two laid-back playboys who try to make it as con-men. Falling in and out of love with beautiful girls in faraway lands, the movies combine the comedy genre with adventure, romance and musical numbers. What makes the “Road to…” movies great to watch is the natural chemistry between the comic duo of Hope and Crosby. Having performed vaudeville shows together years earlier, the two were born to be great. In “Road to Singapore” Hope and Crosby play two sailors running away from their unsatisfactory shore romances. The two friends spend most of the movie in Kaigoon, where they meet dance performer Mima, played by Lamour. While living together, the trio sets up several cons to make some money, but hopelessly fails to do so. “Road to Singapore” is a movie filled with gags and quips and entertains until the end. Though the movie is not the best in the series – partly because it was not written specifically for the new comic duo – but watching it is a natural starting point for digging through all seven movies! The sequels continued to improve on “Singapore” and “Road to Morocco” (1942) is often named as the best of the series.